While answering a salvo of queries on the controversial Rafale aircraft deals, Chief of Air Staff Air Chief Marshal BS Dhanoa, in defence of the deal, said that Rafale, when inducted, will be a game changer in the sub-continent. He was addressing the annual press conference ahead of the October 8 Air Force Day. While discussing the operational impact of the depleting fighter squadron, he said that the 'Gaganshakti exercise' aptly showed the operational capability of the IAF. On the delays in delivery by HAL, he said, "There has been a delay in the delivery schedule in contracts already executed to HAL. There is a three years delay in delivery of Sukhoi-30, 6 years delay in Jaguar, 5-year delay in LCA, and 2-year delay in delivery of Mirage 2000 upgrade." Refuting all allegation of over payment for the Rafale, he said, "It's not simply possible that the new cost would be higher than the cost finalised earlier." On the expansion of the aviation infrastructure in Tibet, he said, "We're watching infrastructure developments. They (China) have been saying that airports are coming up for regional connectivity. We have a plan to counter that.. 50 aircraft in Tibet is no threat." Chief also announced 'Baba Mehar Singh Swarm Drone Competition' for autonomous UAV swarms. The winner of the competition will get INR 10 Lakh. IAF has pledged INR 10 crore for development and additional funds for co-production. 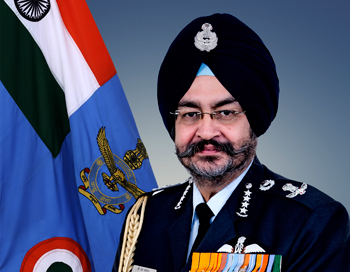 During the Press briefing, ahead of the 86th Air Force Day, CAS Air Chief Marshal BS Dhanoa, specifically answered two questions put to him by Jayant Baranwal, Editor-in-Chief, SP’s M.A.I. Jayant Baranwal: What will be the number of squadrons in 2022 when delivery of 36 Rafale is completed? Chief of the Air Staff:	It will remain the same number of squadrons i.e. 31 - similar to what it is today, with some LCA Mark 1A coming in. Jayant Baranwal: When will finally the Avro Replacement be signed? Chief of the Air Staff: Should be by the end of this financial year.